Downtown’s San Diego newest condo tower is designed by the team of Kohn Pedersen Fox and Chris Dikeakos Architects and it features a top that resembles a seashell. About 16,000 square feet of retail space is planned at the ground floor. Previously known as Parcel 9 at Broadway and Pacific, the 41-story, 216-unit project under construction it now has a name: Pacific Gate! Bosa had asked the public to name this condo project through a contest and it has found the winning name. Completion of the Pacific Gate condo tower at Broadway and Pacific in Downtown San Diego is expected in the summer of 2017. In mid December both Fox News and Union Tribune reported that Vancouver based developer Nat Bosa had green lighted his next and most expensive condo high-rise project known as Parcel 9 at the corner of Pacific and Broadway in Downtown San Diego to soon break ground and be completed in 2017. Finally after much anticipation, last week Bosa broke ground on Parcel 9 at Pacific and Broadway located in the Columbia neighborhood of Downtown, just south of Santa Fe Depot. Parcel 9 at Santa Fe Depot, the project doesn’t have a name yet as Bosa plans to hold a marketing contest to select what it will be called, will be a 450-foot, 41-story high-rise and will include 232 residential condo units ranging from 956 to 2,083 square feet and 16,027 square feet of retail space, possibly for a signature restaurant. This new tower is been built just west of Electra, another of Bosa Development’s flagship condo project. Condos at this Bosa new condo development at Pacific and Broadway are projected to sell at an average of $1.75 million. According to the same reports even the smallest units at the currently projected rate of $1,060 per square foot would sell for just over $1 million. If condos on this new high-rise project actually sell at those expected prices that will significantly raise property values on all other downtown San Diego condos that currently sell in the $400 to $600 per square foot price range. Bosa said similar condos go for even more in Vancouver, Seattle and San Francisco, partly due to interest from foreign buyers who are looking for places to park their wealth. They represent 10 to 12 percent of buyers in those cities, he said. More information on this new Bosa condo tower in Downtown San Diego will be posted on the tower’s own page as soon as a permanent name for this project has been determined. Call us if you would like to be put on the interest list. Year around resort style living plus access to all Petco Park events including all San Diego Padres home games! Seller will entertain offers from $645,000 to $655,000 on this rarely lived 19th floor, 2 bedroom – 2 bath view residence. Hardwood floors, stainless steel appliances, granite countertops, custom lighting, laundry room by kitchen, peek views to the Ballpark and Coronado Bridge from the master bedroom, views to the city lights and the Bay from balcony and both bedrooms. Resort style amenities at the Legend in Downtown’s Ballpark District include full time concierge, 24-hour security, pool & spa, BBQ with seating area, fully equipped large fitness center, a sauna & steam room, a 7th floor indoor entertainment room with a kitchen with a 3,200 square feet terrace with fire pits and BBQ overlooking the Petco Park. View full details and photos of this amazing condo residence at 325 7th Avenue in Downtown San Diego. Also visit The Legend bulding’s page for a video tour of the building and its amenities. 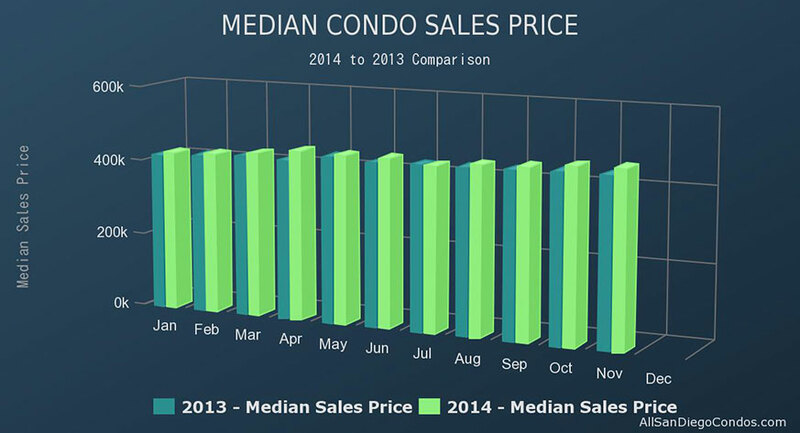 Our Downtown San Diego real estate market trends page was just updated to include condo sales data for November 2014 as was reported by SDAR & Sandicor. In short, including November 2014 sales data, year-to-date the median sales price for Downtown San Diego Condos was up by 4.5 percent to $465,000. The overall median sales price in the County for San Diego Condos, including downtown was also up by 11.4 percent to $323,000. While November was the slowest month of the year so far, pending condo sales in downtown jumped by 33.3 percent over those to previous year to 64. Everything else remained slow at lower levels to those of the previous year. New condo listings as well as available condo inventory both were down by 3.6 and 19.8 percent respectively. The Little Italy Association and San Diego based developer H.G. Fenton broke ground yesterday, December 1st on Piazza Famiglia, a 10,000 square foot public plaza to serve the Little Italy neighborhood and Downtown San Diego residents and visitors. Piazza Famiglia which is set to be completed by Christmas 2016, is a mixed use development that will include shops, restaurants and residential units. The developer also plans to add 55 parking spaces underneath the piazza. Officials said that the Piazza Famiglia’s design will emulate those grand piazzas found in Italy. It will feature classic Italian architecture and design and will include landscaping, seating, gathering areas and a water fountain. The piazza will definitely be a welcomed addition to Downtown San Diego and its residents. It’ll be on West Date Street, between Columbia Street and India Street and eventually the piazza will become a community gathering space hosting the farmer’s market, concerts and cultural events.